In the wide world of retail, knowing how to speed up cash desk transactions becomes a decisive factor. Faster transactions are immediately transformed into increased profitability for the overall business. For those who are looking to speed up the flow of customers through cash desks, Olivetti presents the PRT 100, a new specialized thermal printer that prints at a blazing 200 millimeters per second. 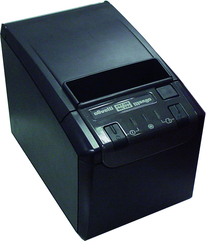 Extremely versatile and practical, it can solve all your cash desk management problems.